Hot water heating equipment has evolved in a big way in the past decade or so. From tank-less systems to solar, roof-top units, the options are plenty. For 140 years, A. O. Smith has led the way in hot-water heating innovation, and is now one of the world’s leading hot water heating system manufacturers. Once again, they have created another solution. 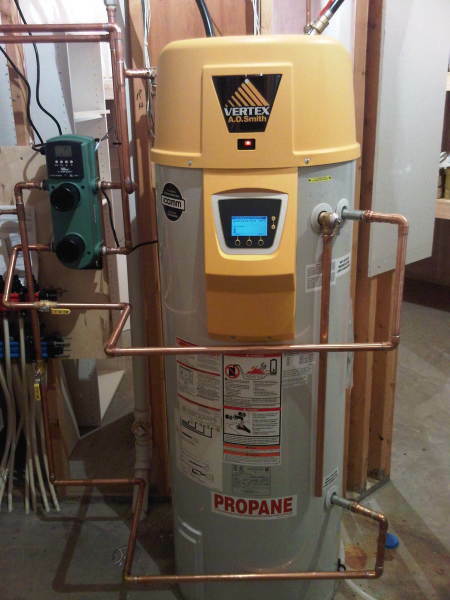 They have developed a super-efficient, gas-fired, residential hot water heater called “The Vertex.” It is a 50 gallon unit that promises to produce more hot water that most comparable 75 gallon gas units. For those of us with children—especially teenagers—we know how critical hot water demand can be. There are 2 primary models. “The Vertex” is a 75,000 BTU unit, and “The Vertex 100” is a 100,000 BTU unit. The 100 comes complete with an LCD, digital control display that not only provides you with the its performance calculations, but tracks performance history, displays diagnostics, and allows for easy adjustment and control. The 100 also boasts that is can deliver over 160 gallons in first-hour delivery. That can easily handle the demands of even the most demanding households. This means you can relax in your whirlpool tub, while your daughter takes a shower down the hall—and with no perceptible loss of hot water for either of you. Your spouse could even jump in the shower during this time. The “Vertex” 75,000 BTU unit can distribute nearly 130 gallons in the first hour. That’s better than a gas-fired hot water heater with a holding tank of 25 more gallons. The recovery rate is 129 gallons per hour. That means that an hour after all those showers and baths, you could practically start all over again. The units need no chimney, and can be directly vented outside, using inexpensive, 2” PVC piping. “The Vertex” and “The Vertex 100” cost a bit more than their counterparts, but are well worth the expense. Installation is the same cost as any other direct-vent hot water heater, and there is a 6 year warranty.